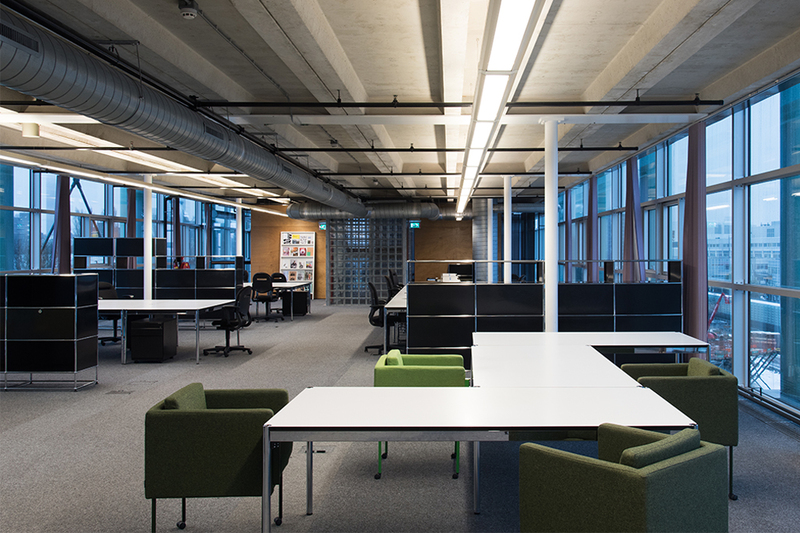 When three institutions come together in a new building, why furnish it with new designs if the existing furniture is still in perfect condition, timeless, flexible and seamlessly fits into the new location? This was the sustainable thinking of the management of Het Nieuwe Instituut, which moved the Deejay’s that Dirk van Berkel designed for Lensvelt in 2001, from their old office in Amsterdam to the new one in Rotterdam. The New Institute was founded in 2013 as a result of a merger of the NAI, Premsela: Dutch Institute for Design and Fashion and Virtual Platform: knowledge institute for e-culture. The decision of the former management to take the existing furniture along to Rotterdam reflects this new organization; the Deejays contribute to the character of Het Nieuwe Instituut. They also align with the sustainable philosophy of doing business and designing that characterizes Lensvelt. The upholstered Deejays are right at home in the extraordinary building designed by architect Jo Coenen. They look as if they have always been there. They are used in the Workspace: workplaces for creative entrepreneurs and enterprising creatives in the world of architecture, design and digital culture. 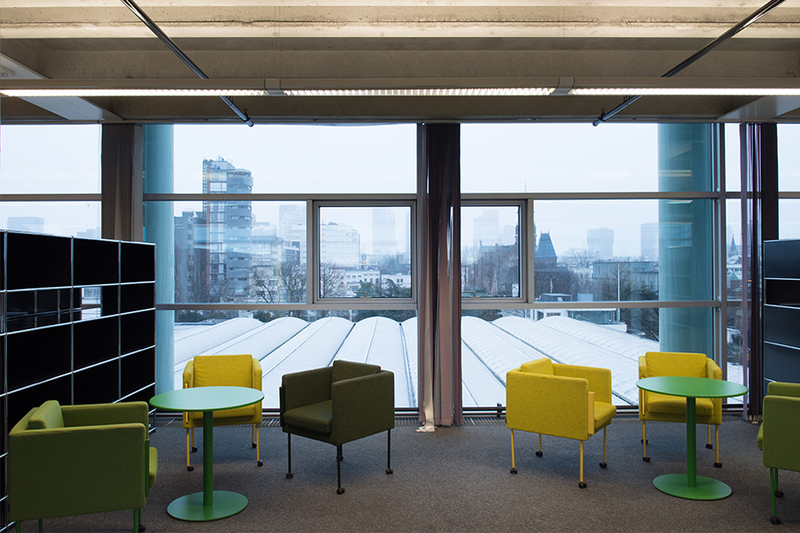 ‘The nice thing about the furniture is that it is very sustainable and can be used in many different ways, both in formal and less formal settings’, the employees of Het Nieuwe Instituut say. And that is exactly what Van Berkel had in mind at the time: designing an idiosyncratic piece of furniture that is informal because of the simple, comfortable-looking egg shell shape and the slender legs. But that simultaneously exudes formality as an upholstered armchair with a chic leather upholstery. Deejay has another advantage: the chair is easy to move because the four legs are equipped with swivel wheels. 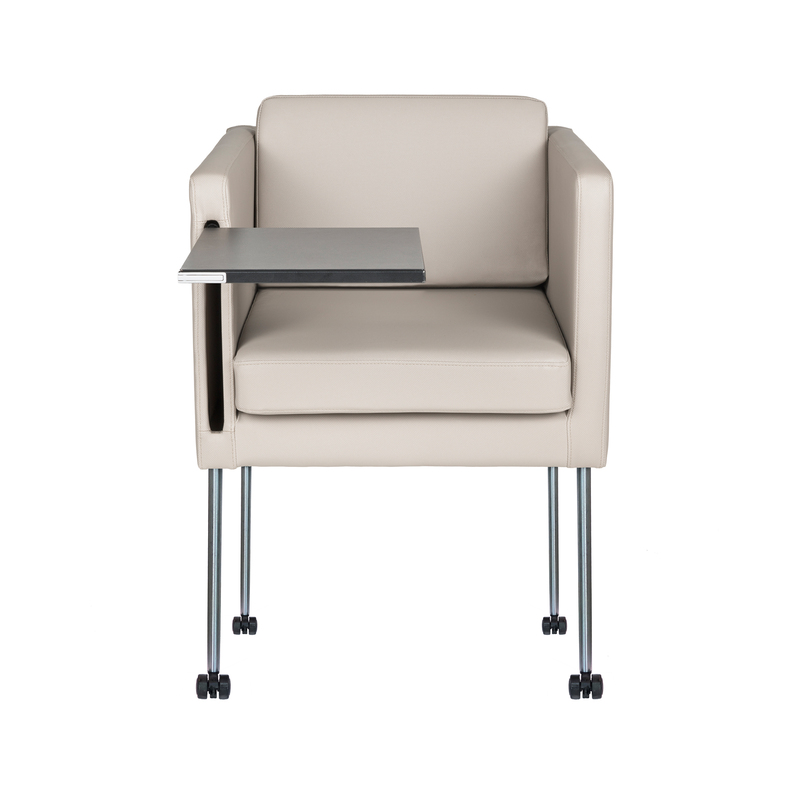 Deejay meets the demand for high-quality furniture that can be used for conferences, seminars and other meeting spaces. The fully upholstered chair is also available with a handy integrated, foldable writing board. The seat and back cushions can be removed, as they are held in place with Velcro.